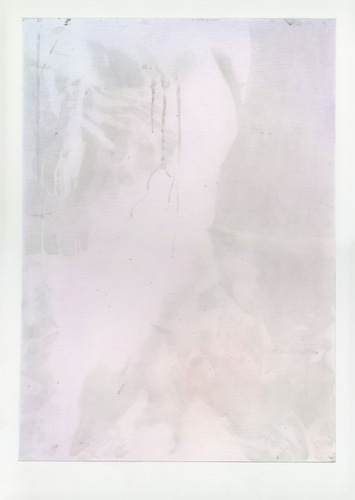 Juliet Jacobson, Dave’s Little Mirror (Drawing #6), 2015, graphite and colored pencil on paper, 20 x 14". Take what you want from all the Marxist cant surrounding Christopher Williams’s long-term project on the history and discourse of the photographic. What one finds at the heart of his practice is something simpler but no less profound: a reverence for the miracle of seeing and for the efforts we’ve made at trying to approximate or capture the mystery of this extraordinary phenomenon with the invention of the camera. Juliet Jacobson is a drawer who works exclusively from photographs, transforming the information of mechanical reproduction into experiences that are startlingly physical and emotive. Though her technical prowess is stunning, her goals are well beyond pat mimesis or academicism. “There Is Nothing Perfectly Beautiful Except the Invisible,” her first solo exhibition at this gallery, is an investigation into the slipperiness of perceived reality, where the idealism of photographic space is shunted out of its Platonic sphere and put back into the sensuous realm of material facture and presence. And sensuous is the word for Jacobson’s graphite and colored-pencil drawings, not simply in the exquisiteness of her hand—which is tender, replete, gorgeous—but also in the scrupulous observation she affords her seemingly banal subject matter. Gently crumpled or folded sheets of white paper and dirtied surfaces of mirrors that subtly reflect pale swaths of prismatic color feel like sites for spiritual projection—empty screens that are anything but, full of divine potential (and, strangely enough, not too unlike religious icons—objects that seem to gaze more fully into us than we into them).